Like the plants that inhabit them, the Smithsonian’s gardens have grown over time. Have you ever heard of Smithsonian Park? If you are visiting the Smithsonian today, probably not. But if you had visited the Smithsonian in the 1850s, it would have been one of the first things you experienced. Smithsonian Park occupied the area between the Smithsonian Institution Building, or the Castle, and Downtown Washington, D.C., now a section of The National Mall. The park was filled with large trees, meandering pathways, and rolling hills. Entering or exiting the Castle towards the city of Washington, D.C. you would have walked out through a carriage porch in to a lush garden. Well-established trees flanked the walkways and carriageways. It would have been a quiet retreat from the bustling downtown just a short walk further north. 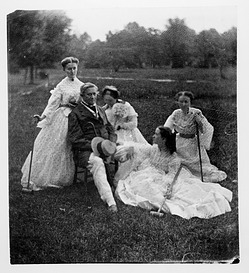 Living in the Castle, our first Secretary, Joseph Henry, and his family occasionally relaxed in Smithsonian Park with a game of croquet. From the Smithsonian’s earliest days, gardens were considered for a central role in the life of the Smithsonian. During debates about the Smithsonian’s founding, the idea of using James Smithson’s bequest for a botanic garden was included in several drafts of the bill debated in Congress. 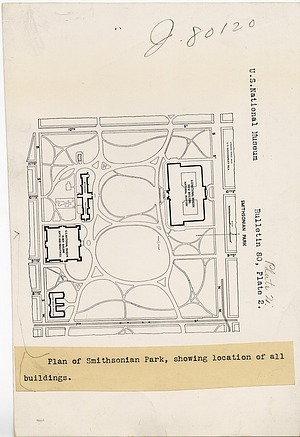 In 1850, President Millard Fillmore commissioned America’s preeminent landscape designer Andrew Jackson Downing to design plans for the National Mall, including grounds around the Smithsonian Castle, then under construction. Downing’s natural style of landscape gardening was a significant departure from the classical design of L’Enfant’s 1791 plan for the city. Downing’s plan proposed four parks, creating “a public museum of living trees and shrubs.” Work began in 1851, but did not get very far. Downing died in a steamboat accident in 1852 at just 37 years old. After his death, Downing’s design of drives and curvilinear walks across the mall through copses of trees and naturalistic plantings of shrubs was never finished. 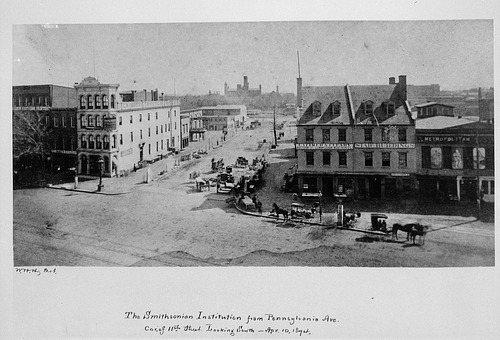 Once the rumblings of the Civil War began, the city was in turmoil and federal resources were scarce. Any plans to continue developing the Mall had to be put on hold. Today, Smithsonian Gardens is a museum in its own right. Accredited in 2013 by the American Alliance of Museums, they are an integral part of the Smithsonian’s research, display, and educational programs. From the Victory Garden at National Museum of American History, which lets visitors experience a typical WWI vegetable garden when growing food for home consumption was an important part of the war effort, to the Polinator Garden at National Museum of Natural History, where visitors can learn about natural plant-pollinator partnerships, they reach across the Smithsonian teaching through experience. These ‘outdoor museums’ are designed to complement the museums they border and carry the learning experience from your first step on Smithsonian Grounds to your last.